Many of us are guilty when transcribing information or recording notes of only including the facts we deem important at the time. You May have kept the names and dates from that old census record‚ but did you also keep track of other information such as years of marriage and country of parent’s origin? Or‚ perhaps‚ you misread a name or misinterpreted a relationship? If you haven’t already‚ be sure to go back to the original records‚ making complete copies and transcriptions and recording all clues – however unimportant they May seem right now. I cannot express enough the importance of citing your sources. Read my article: “Citation Guide“. Sometimes we are our own worst enemy. You May have created the brick wall by recording incorrect information. This is WHY it is so important to CITE YOUR SOURCES. I had another adoption case…all I had was a first name that could have been the name‚ short for her real name or a nickname. I had a last name…married or maiden I had no idea. The name was on a hospital receipt from a hospital in Los Angeles County that was no longer in existence. My initial census search yielded nothing. I was not surprised. Then I did another search…only this time I used a little used known tool called SOUNDEX. Basically you are telling the search engine to return results that look like‚ smell like or sound like your desired search terms. My results were amazing. It turned out the transcriber turned the letter N in her name into two R’s for the 1930 census. The 1940 Census the name was completely mangled. Published sources often contain transcription errors‚ while even original documents May contain misinformation‚ whether purposefully or accidentally given. If you did not Cite your source you will never remember where to return to verify your information. Try to find at least three records to verify any facts that you already know and judge the quality of your data based on the weight of the evidence. Your brick wall May just be something as simple as looking for the wrong name. Variations of last names can make research complicated‚ but be sure to check all spelling options. Soundex is a first step‚ but you can’t count on it entirely – some name variations can actually result in different soundex codes. Not only can the surnames be different‚ but the given name May be different as well. I’ve found records recorded under initials‚ middle names‚ nicknames‚ etc. Get creative with name spellings and variations and cover all the possibilities. My last name for example‚ “AIRRINGTON” has 39 spelling variations. Everything from Airrington to Arrington to Hairrington to Heninto to Yerrington and more. (http://airrington.com/family/?page_id=21) Check variations…it could have been as simple as the informant not know how to spell your name. Do you know how many times I have received mail with the wrong spelling? Or went to the doctor only to have a nurse call my saying‚ “Mr Harrington…Mr Harrington” or they completely fuddle my name? What’s worse they have fuddled it official medical records. Even though you know that your ancestor lived on the same farm‚ you May still be looking in the wrong jurisdiction for your ancestor. Town‚ county‚ state and even country boundaries have changed over time as populations grew or political authority changed hands. Records were also not always registered in the locality where your ancestors lived. In Pennsylvania‚ for example‚ births and deaths can be registered in any county‚ and many of my Cambria county ancestor’s records were actually located in neighboring Clearfield county because they lived closer to that county seat and found it a more convenient trip. So‚ bone up on your historical geography and you just May find a new route around your brick wall. Recently I posted the following tip on my twitter. “Just because a record indicated that grandpa was born in Cameron Twp‚ Minnesota‚ that does not mean he was actually born there. Be sure and replace “in” with “near.” And there is always a chance that the person gave the county seat as the place of birth instead of the township‚ village or rural farm where the birth actually took place. Also‚ pay close attention to where boarders were and when you are looking. Why is this important? Because borders change‚ that’s why! One of the most office border changes that comes to mind is Virginia and West Virginia. If you are Civil War buff then you know this. But after the Civil War West Virginia split from Virginia. 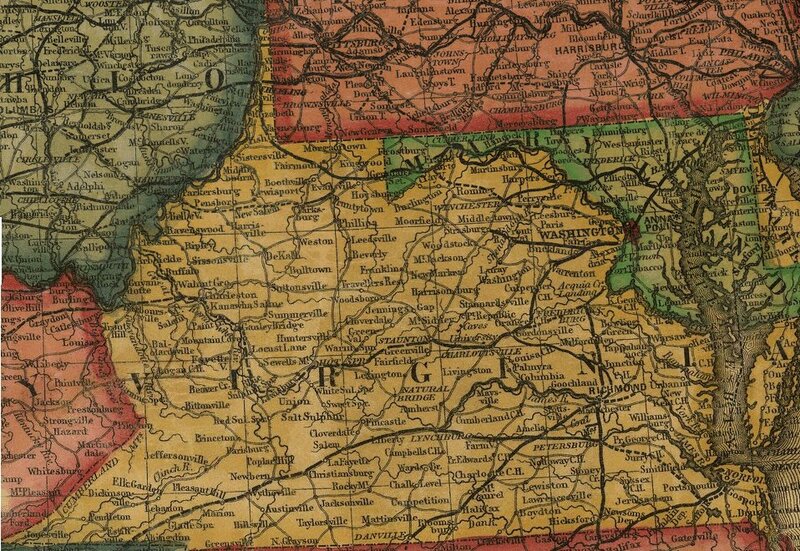 Here is a map of Virgina before the war: Map. 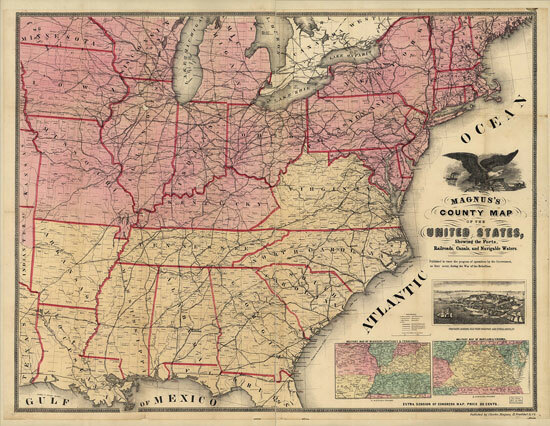 Here is a map of the Eastern United States Pre- Civil War: Map. Finally‚ here is a map of present day Eastern United States: Map. West Virginia did not become a state until July 20‚ 196’. This is why I am a PROFESSIONAL GENEALOGIST and a HISTORIAN. Knowing your history will drastically improve your hunt! Fresh eyes can often see beyond brick walls‚ so try bouncing your theories off other researchers. Contact me and I will be happy to help you bust a brick or two. See my fees page. I think that you will find me surprisingly affordable. And listen‚ I LOVE this. So‚ if I can help you and it is not too time consuming‚ I will do it for free. Please send me your questions…those are always free! Be sure to include what you already know‚ as well as what you’d like to know and which tactics you’ve already tried.Listen‚ I am a very fair man. If I look at what you have and the answer is staring at me…I will waive any fees. perhaps you can return the favor at some point. I am always looking for local researchers and foot soldiers. I am in Oregon and if you live in Connecticut (or wherever)‚ I May need a document…that’s where you could come in. You alk in the building an get it for me.